It's no secret that more and more bloggers earn revenue from their relationships with brands. The best and most successful blogs are able to maintain their authenticity and trust with their audience by being honest and only supporting brands that the bloggers themselves believe in. As part of the POPSUGAR 2015 Blog Influence Report, we partnered with CJ Affiliate by Conversant to ask 2,500 women to share their thoughts about the role that blogs and bloggers play in their shopping and purchasing decisions, especially their opinions of branded content and promotions. 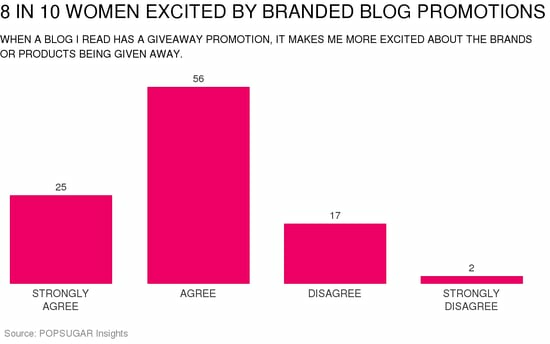 Overall, 82% of women get excited about the brands or products that are featured in a blog's promotion or giveaway. Over 56% of women agree that branded promotions are exciting and over one in four women strongly agree that these are positive events. In terms of sponsored posts, women find these to be informative (47%), persuasive (19%), and entertaining (17%), and women are motivated to read sponsored blog posts when they are in the market to purchase the product or item that is featured (53%); when they find the content, brand, or product interesting (53%); when they are curious about the brand that is sponsoring the post (50%); or when they have positive associations with the brand that is sponsoring the post (38%).